Best Airline Stocks To Buy: It wasn’t long ago the most successful investors in the world wanted nothing to do with airline stocks. In 2008, Warren Buffett said that airline companies have no hope of generating profits, and he told his shareholders that “the best thing a clairvoyant economist in 1903 could have done for future investors would have been to go to Kitty Hawk and shoot down Orville Wright”. From 2014 2017, US airline stocks rose nearly 90 percent, which produced substantial earnings for shareholders. Buffett’s holding company Berkshire Hathaway [NYSE: BRKA] had invested in the four major US airlines: United Airlines [NASDAQ: UAL], Delta [NYSE: DAL], American Airlines [NASDAQ: AAL], and Southwest Airlines [NYSE: LUV] and enjoyed an impressive payday as a result. The big question today’s investors are asking is whether the boom is over or will the industry produce these kinds of results again? The negative sentiment around airline stocks that prompted Buffett’s 2008 remarks had to do with the obstacles airlines face when it comes to generating revenue. Traditionally, the biggest con when it comes to investing in airlines is that share prices are unpredictable, because the airline industry is extremely sensitive to a number of outside factors. One of the most difficult challenges for airlines to weather is the volatility that comes with standard market cycles. Downturns in the economy hit companies in the travel industry earlier and harder than other areas, and recovery is much slower. When budgets tighten, leisure travel is one of the first things consumers cut out. Businesses follow suit shortly thereafter, trimming travel expenses to offset any drops in their revenue. Unfortunately for airlines, these line items are often the last to be added back into budgets when the market picks up again. Fuel prices are another significant challenge for the airline industry. Natural, economic, and political factors influence the cost of fuel, and changes in pricing can be sudden and dramatic. A single bad storm can drive prices up for weeks or months. Because airlines aren’t in a position to reduce their fuel consumption at least not without plenty of lead time to strategize the additional fuel cost comes out of profits. The third major challenge that airlines face is around labor. Most employees are unionized, which means there is little flexibility when it comes to staffing policies, scheduling, pay rates, and similar. Worse still, contract disputes can ground airlines for days and weeks at a time. All of these issues combine to make reducing expenses related to the workforce nearly impossible. Despite these challenges, many investors now believe that there are pros to buying shares in major carriers like Delta Airlines [NYSE: DAL], United Airlines [NASDAQ: UAL], Southwest Airlines [NYSE: LUV], and American Airlines [NASDAQ: AAL]. Most of this optimism results from the strategic changes airlines have made to reduce their sensitivity to outside factors. Is Delta Airlines Stock Worth Buying? At any given moment, it is difficult to predict how an individual airline stock will perform. For example, Delta predicted its revenue per available seat mile (RPASM) to grow 3 percent to 5 percent for the fourth quarter of 2018, but shares lost value at the beginning of December when the company announced it would come in at just 3.5 percent. Prices dropped further at the beginning of January when that forecast decreased to just 3 percent. As is typical for the airline industry, RPASM doesn’t necessary tell the whole story. Thanks to lower fuel prices, Delta is still expecting earnings per share between $1.10 and $1.30. Some investors who have decided to buy now, because they want to take advantage of the value pricing. They are confident that share prices will rebound in the near future. Other investors have decided to wait. They expect an upcoming price war to depress RPASM across the industry, lowering stock price for all US carriers. Should You Invest In United Airlines Stock? Investors whose primary focus is earnings per share are likely to lean towards United Airlines stock [NASDAQ: UAL]. United enjoyed strong earnings for three consecutive quarters, and it indicated that it expects a full-year adjusted earnings per share of $8.00 to $8.75. This is a significant change to the original guidance, which offered a range of $6.50 to $8.50. The improvement is even more impressive when investors consider that United is paying $700 million more than originally budgeted for fuel. The impressive earnings appear to be a result of United’s change in strategy. The carrier is focused on accelerating its growth rate by paying special attention to smaller cities. United expects to be the airline of choice once it develops a presence in areas that currently struggle with limited travel options and a complete absence of direct flights to popular destinations. Though its has long been a major player in the airline industry, United has always struggled to match its competitors when it comes to profitability. However, in 2018 the change in strategy allowed United to surpass American Airlines. Of course, catching up to Delta promises to be a bigger challenge, but investors are still more excited about United than they have been in years. American Airlines Stock: Yay or Nay? All signs point to a decline in the price of oil, which put many investors in the mood to buy airline stocks during the fourth quarter of 2018. American Airlines enjoyed a bump of 14.5 in November, though the gains didn’t remain intact through the first of the year. This is an important signal for investors who are focused on short-term profits. In general, though, American Airlines [NASDAQ: AAL] isn’t the first choice among the four U.S. carriers. At the beginning of January, American traded at approximately 13 times its earnings. While this ratio is reasonable when measured against the marketplace as a whole, it is high compared to some other airline stocks. This, in addition to American’s third place ranking in terms of profits, makes one of the other carriers a better option for most investors. Is Southwest Airlines Stock a Buy or Sell? Southwest Airlines [NYSE: LUV] faces all of the same challenges of its peers, but as a company, it enjoys certain advantages that competitors don’t have. For example, of the four major US carriers, Southwest’s LUV stock tends to offer the biggest bargain. As of January 2019, Southwest [NYSE: LUV] cost just 7.6 times its earnings, potentially making it less risky for investors. Perhaps more important, Southwest customers are loyal. While other commercial airlines usually win business based on who has the lowest ticket price, Southwest customers don’t tend to shop around. They know they typically get the best fare with Southwest, and even if it isn’t the lowest, they avoid most add-on fees. Southwest allows each passenger two pieces of checked luggage at no additional charge, and there are no change fees to adjust dates and times of travel. Southwest consistently wins industry awards for customer service, including the top spot on J.D. Power’s 2018 North America Airline Satisfaction Study. It’s true that 2018 was not a great year for Southwest, and share prices have dropped in the past 12 months. This stock offers a comparatively low 1.2 percent dividend, which deters some investors. However, business remains steady, and there is every reason to believe that when share prices rise across the industry, Southwest stock prices will go up as well. 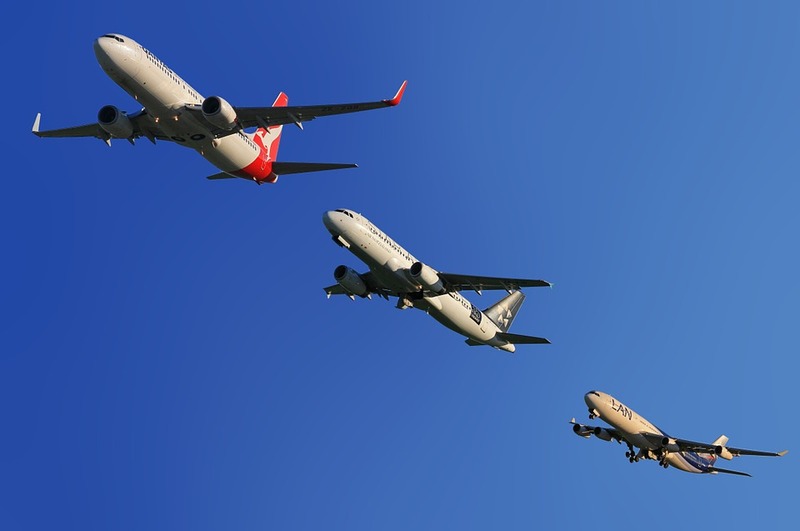 Overall, analysts indicate that smart investors can be successful with airline stocks. Which to purchase and when to invest depend on your personal level of risk tolerance, as well as your short-term and long-term financial goals. Many investors watch for a drop in airline stock prices following an economic downturn, because they are confident that the shares they buy at discount prices will eventually regain their value.